Quintessentially British design and exquisite craftsmanship combine with the vintage-inspired Emmy London collection. This elegant diamond ring is beautifully crafted in 18ct rose gold, presenting a single sensational oval morganite stone centrepiece, surrounded by sparkling round diamonds. Further dazzling diamonds accentuate the ring shoulders within milgrain detailed frames. A timeless ring in flawlessly feminine shades. A secret stone is set within the band, alongside the Emmy London signature, with the total diamond weight of this ring being 0.20ct. 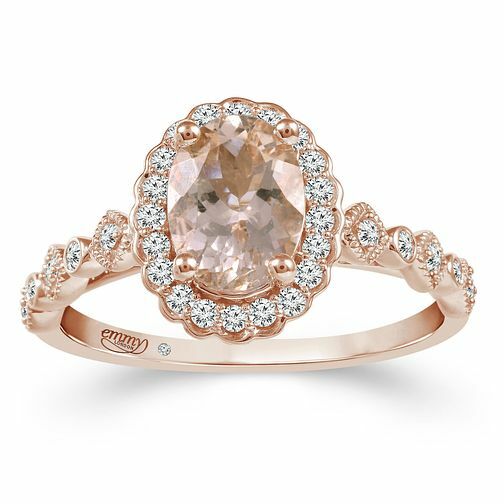 Emmy London 18ct Rose Gold Morganite 1/5ct Diamond Ring is rated 5.0 out of 5 by 1. Rated 5 out of 5 by Anonymous from Beautiful Beautiful ring would recommend it to anyone and customer service was very helpful.